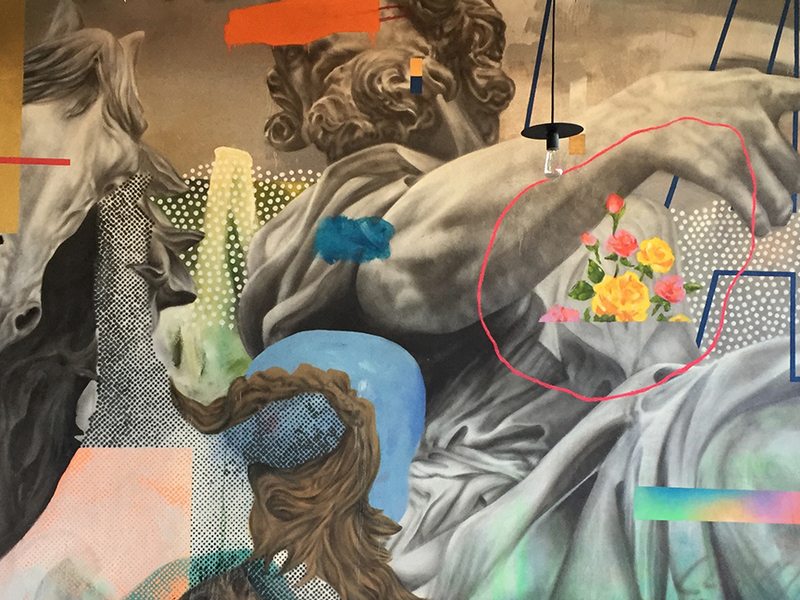 Above: the mural in the main dining room at Rossoblu, which will “hard” open in just a few weeks in downtown Los Angeles. What a thrill to see my friend Steve Samson profiled this week in the LA Times for the opening of his new downtown restaurant (where I’m writing the wine list). While Samson has earned a following for his perfectly blister-flecked, wood-fired pizzas at Sotto, his Southern Italian restaurant in Pico-Robertson, you will not find a single pie on the menu at Rossoblu. Instead, Samson’s newest project will allow him to flex other muscles, crafting a menu that reads as an ode to the Italian cuisine of the Emilia-Romagna region in Northern Italy. Samson’s connection to Emilia-Romagna runs deep. The region is home to his favorite soccer team, F.C. Bologna, referred to by fans as rossoblu (after the team’s red and blue colors). It’s also the place he spent his childhood summers with his mother’s family. Each summer he grew more enamored with the food and culture that would one day drive him to abandon a prospective career as a doctor to become a chef. Steve and I first met back in 1987 — 30 years ago! — when we were both juniors at the University of California (I was at UCLA and he at UCSD) and we were both spending our year abroad in Italy. Even though he was studying in Venice and I was in Padua, we became fast friends and it didn’t take long before he took me with him to Bologna, where he spent summers as a kid: his dad studied medicine on the GI Bill at Bologna where he met Steve’s mom. She grew up in the city’s San Donnino neighborhood. It was such a great experience for me, during my first year in Italy, to experience Bologna and Steve’s family’s life and circle of friends there. Dindo, one of Steve’s best friends growing up, is still one of my best friends, too (here’s a song I wrote for him). Seven years ago, when Steve was getting ready to launch his first restaurant in LA as chef/owner, I had just moved back to California from New York where I had spent a decade working as a translator, wine and food writer, and musician. He had always said that he wanted me to write the wine list at his restaurant and even though I had picked up and moved to Texas to marry Tracie P by the time he opened, he insisted that I be the restaurant’s wine director. We’ve been going strong together ever since and I couldn’t more thrilled to be part of the new project and more proud to be Steve’s friend and colleague: it’s so wonderful to see someone you love thrive like this and achieve a lifelong dream. Congratulations to Steve and his wife and partner Dina on this new gastronomic adventure! I am so stoked to be a part of it. As soon as the restaurant officially opens next month, we’ll begin planning our first wine dinners and tastings etc. In the meantime, if you happen to be in LA next week, I’ll be leading a tasting of Campania wines at Sotto, Steve’s other restaurant, on Tuesday, May 23 (click here for details and reservations). Please join me! Thanks for your support, everyone. I feel so blessed to do what I do for a living and so lucky to be surrounded by so many talented and gifted people like Steve and Dina. ← In a world with greater wine knowledge than ever, why do we neglect sparkling?